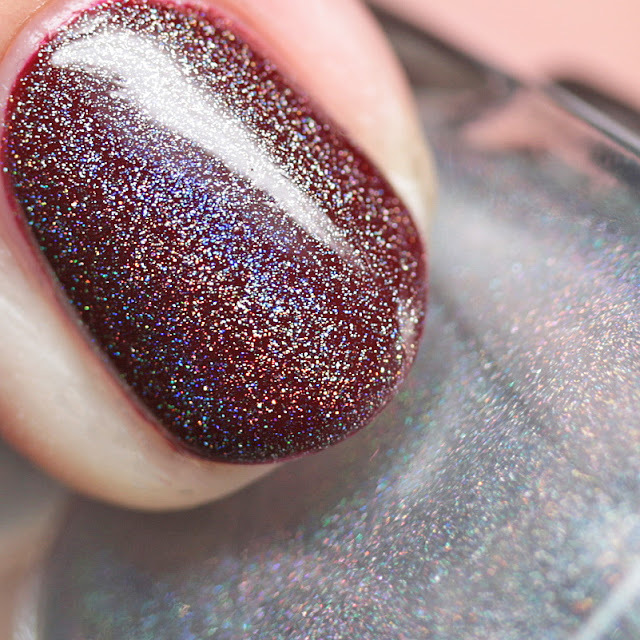 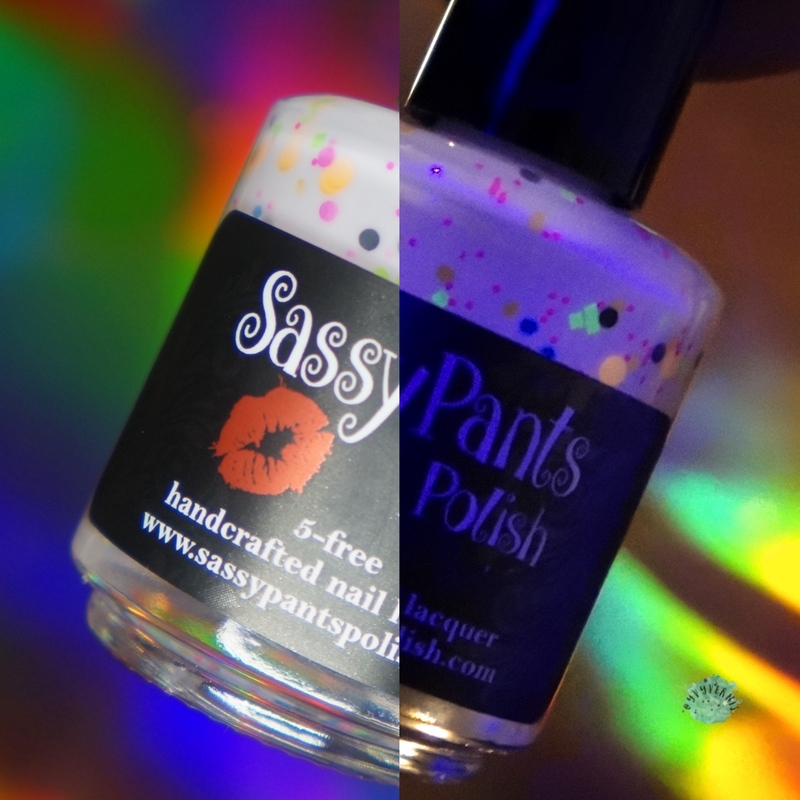 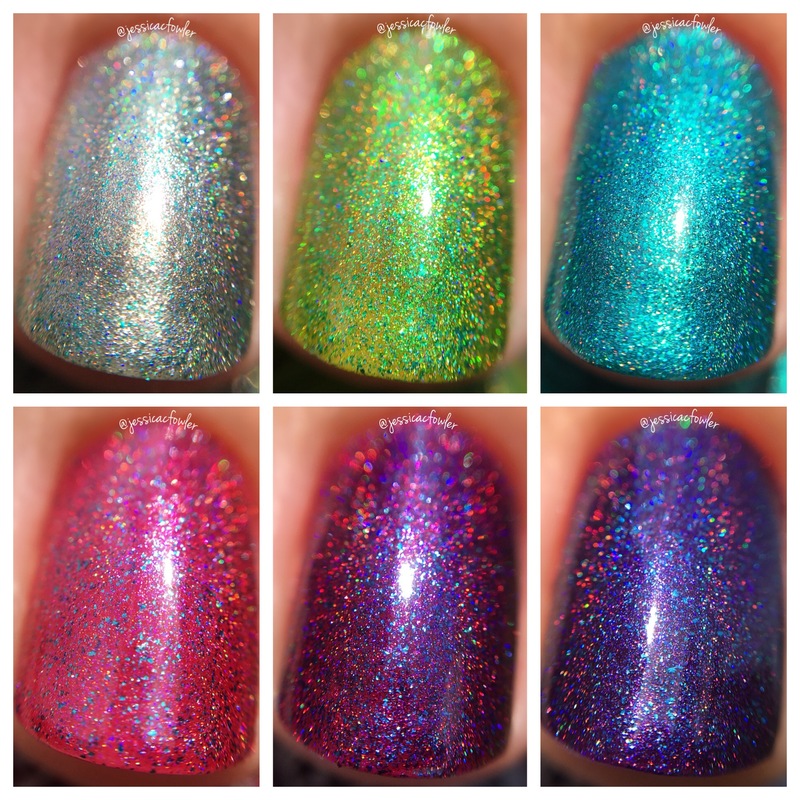 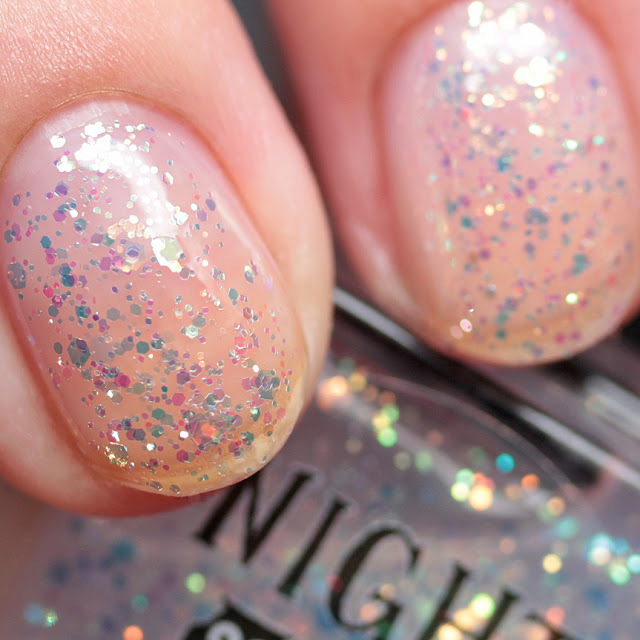 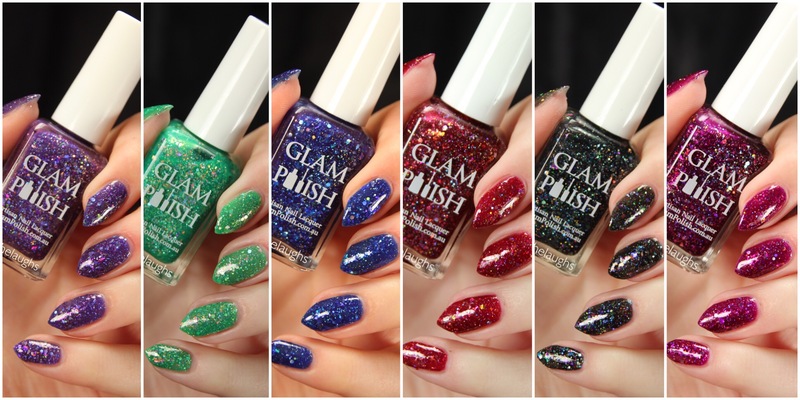 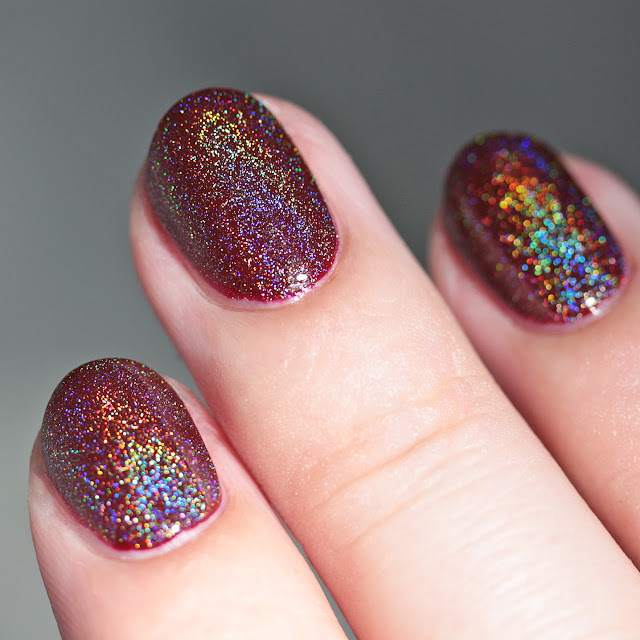 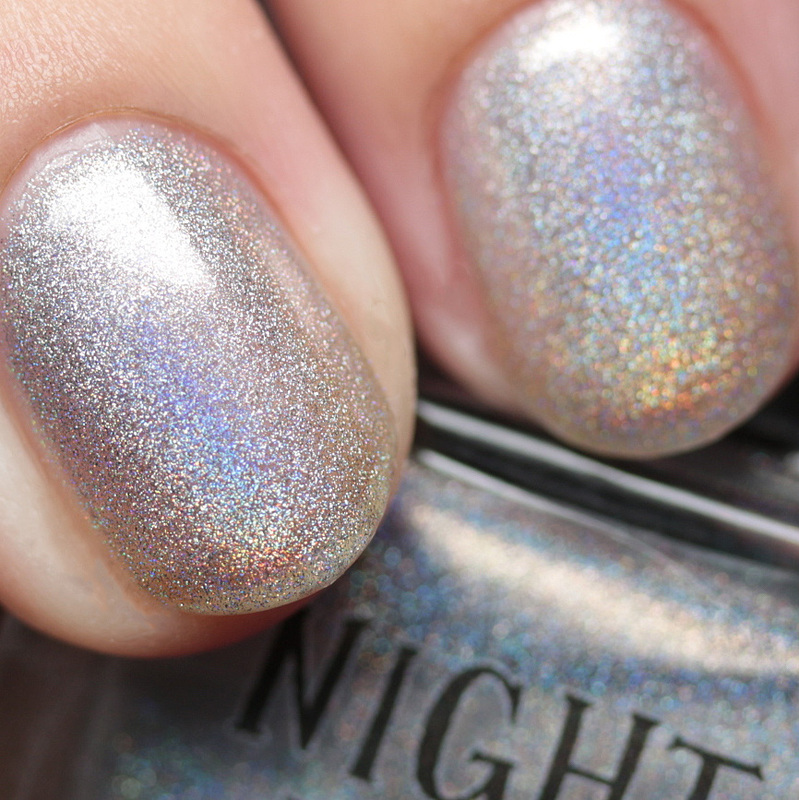 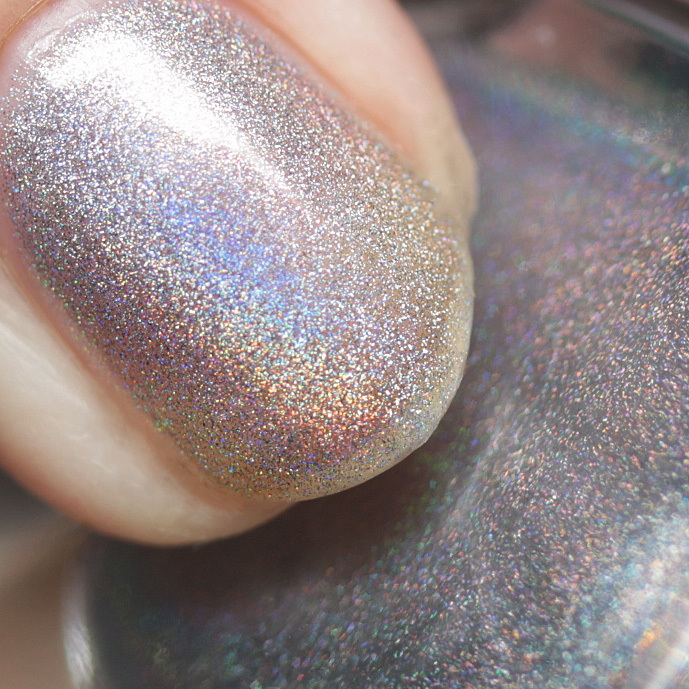 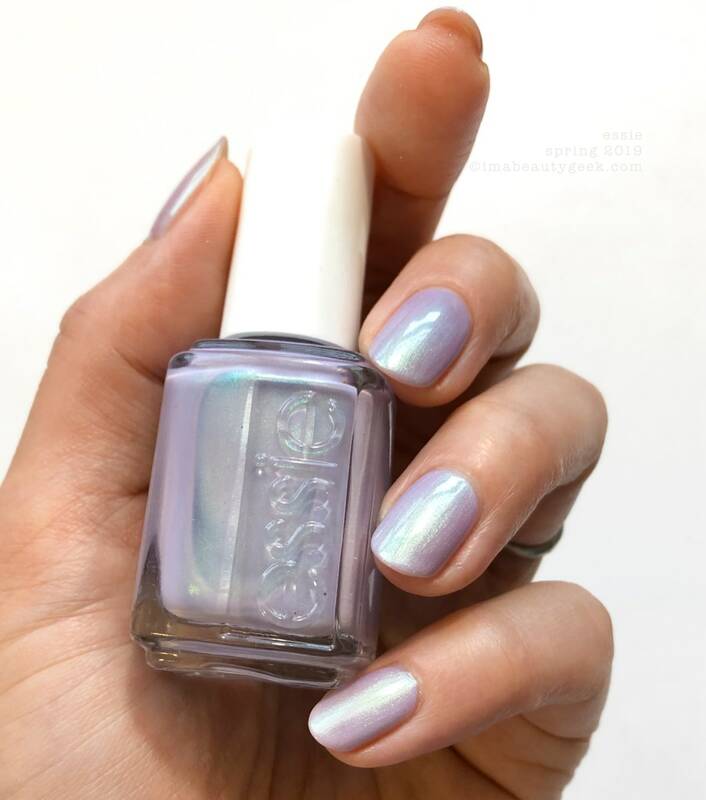 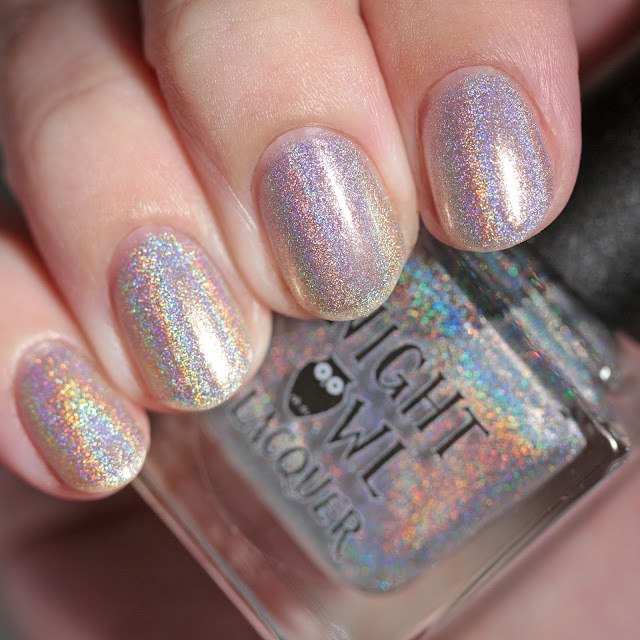 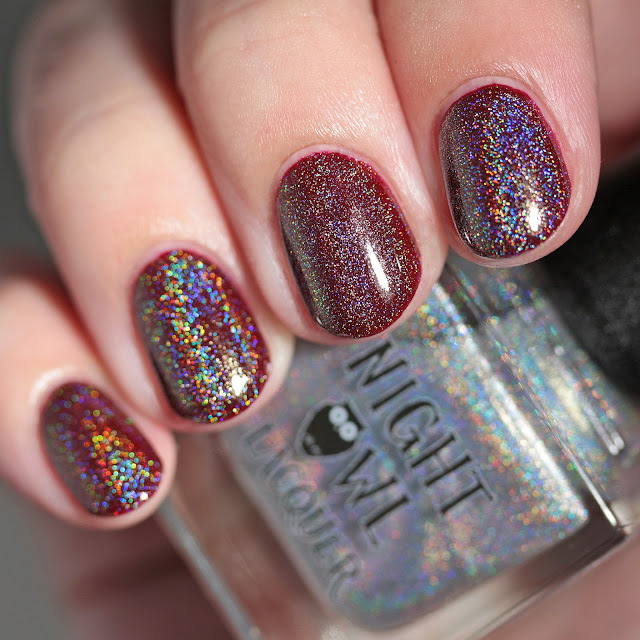 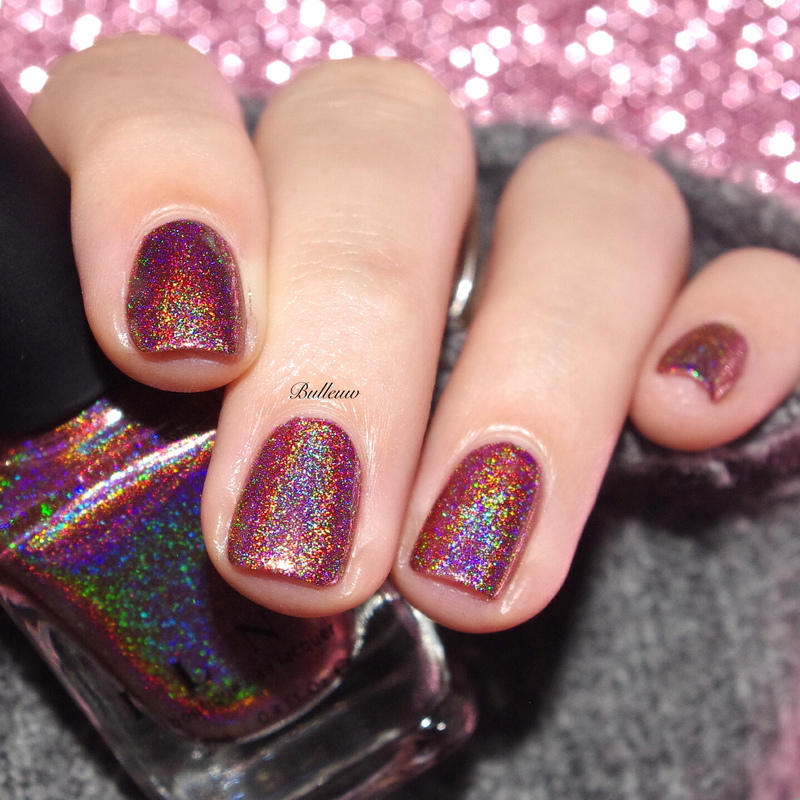 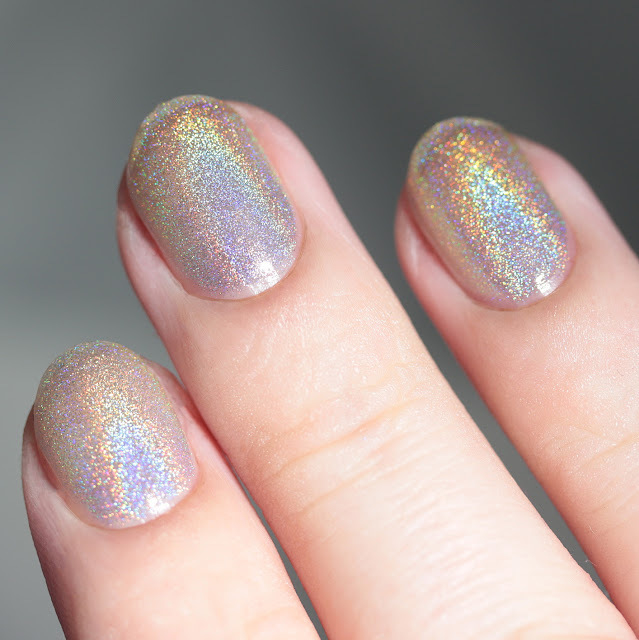 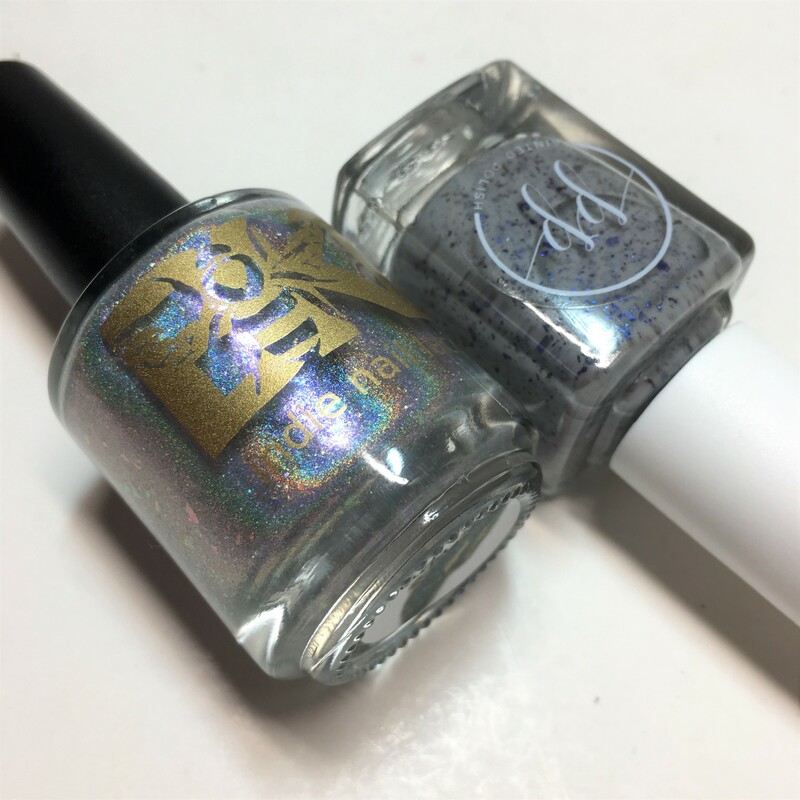 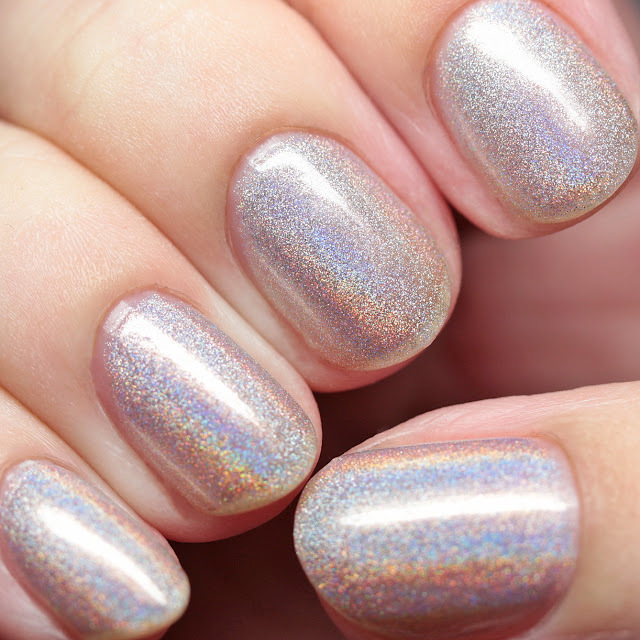 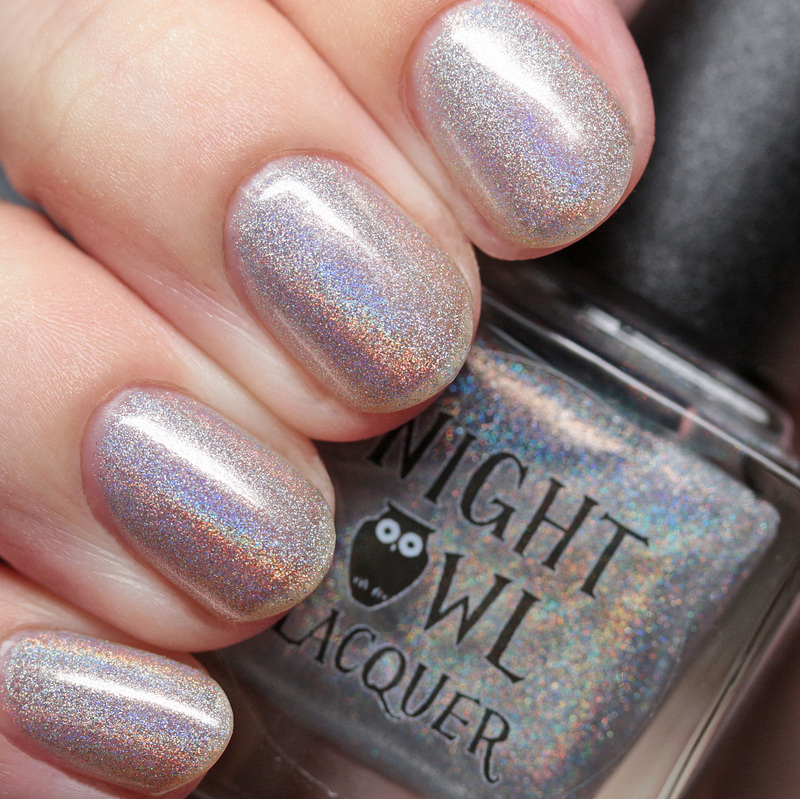 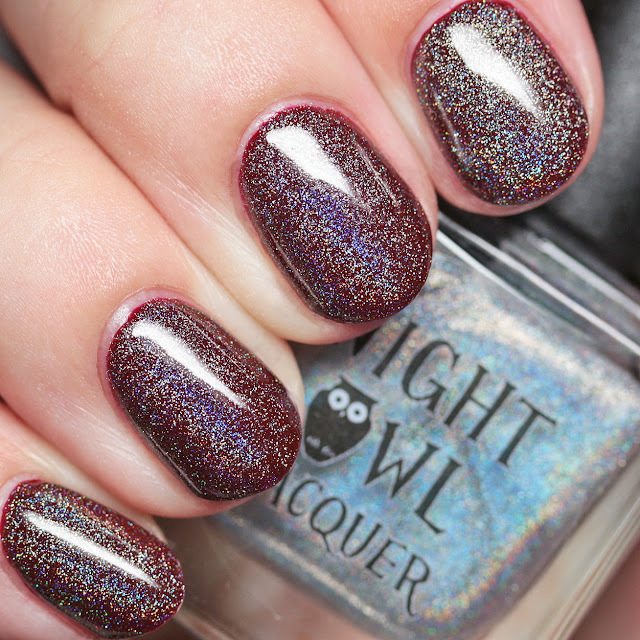 Night Owl Lacquer Just Like Magic is a linear holo in a clear base. 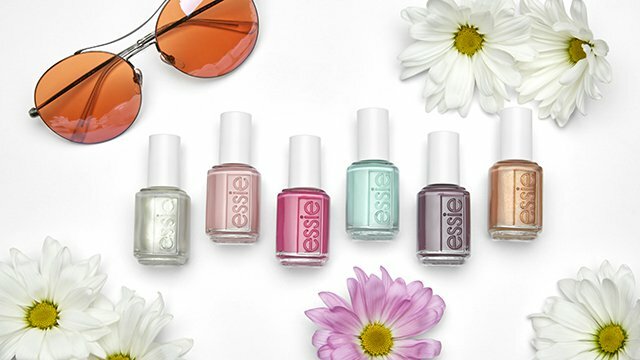 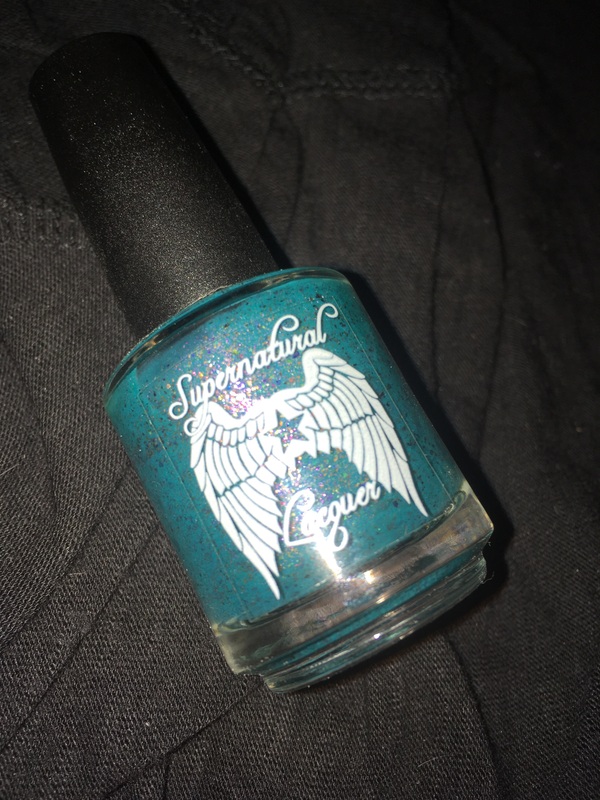 I wore it here with four thin coats for full coverage but you can get it with three as well. 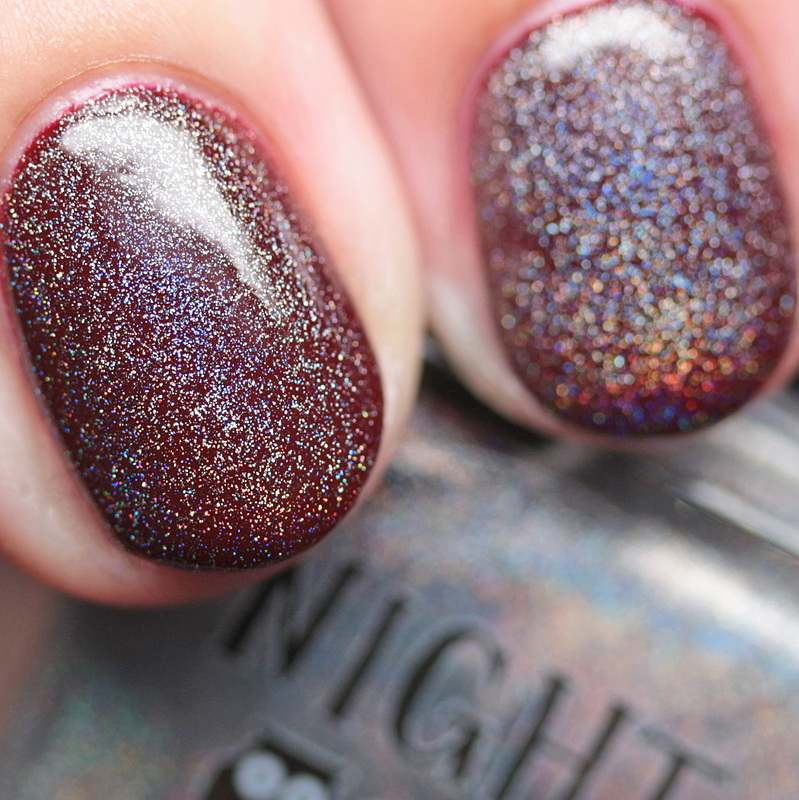 This is a super-sparkly, dense topper. 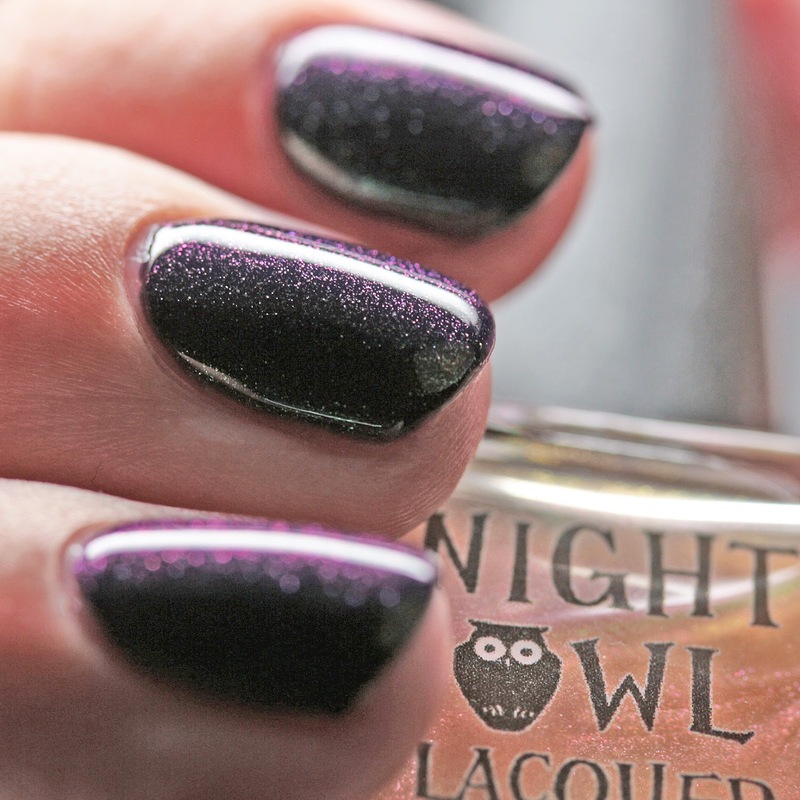 Here is Night Owl Lacquer Just Like Magic in one coat over Bite Me. 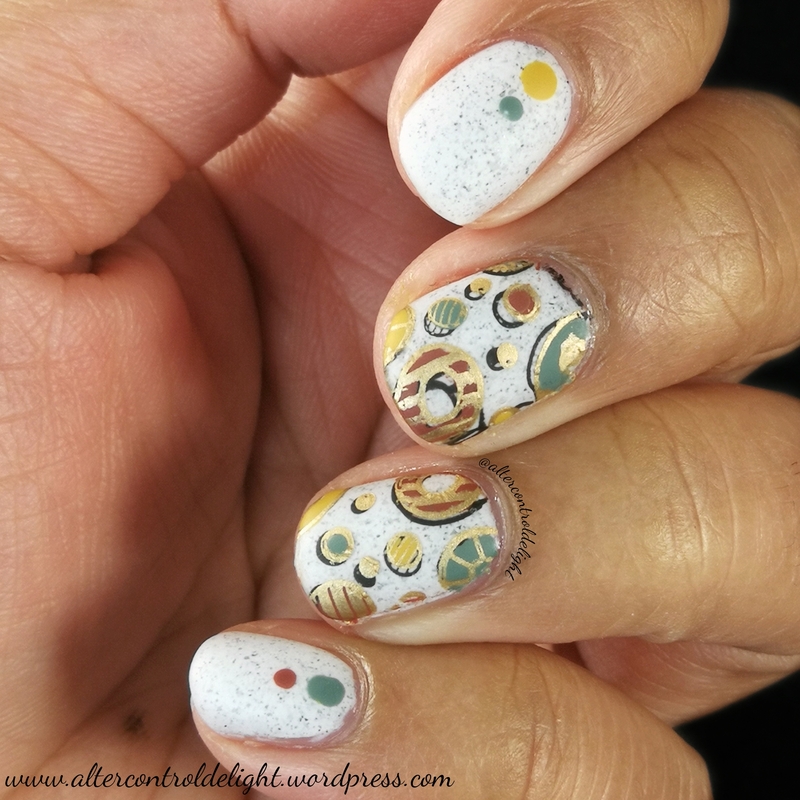 It definitely backs a punch for very little effort! 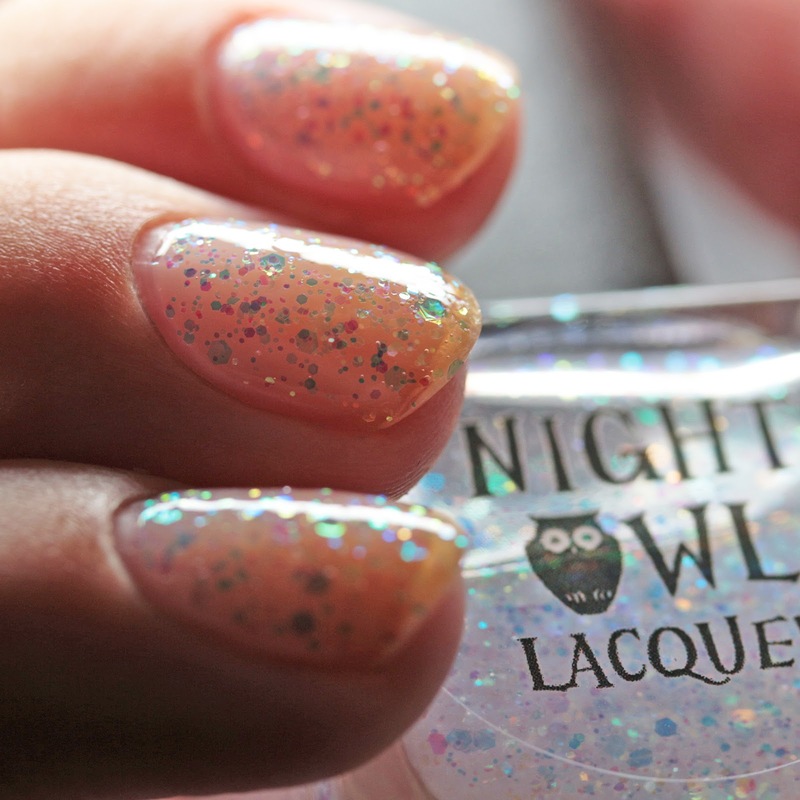 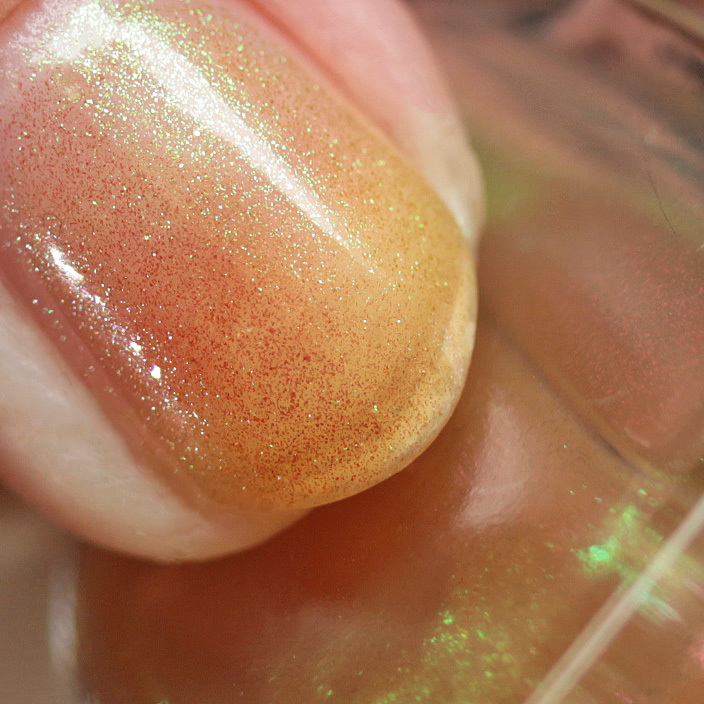 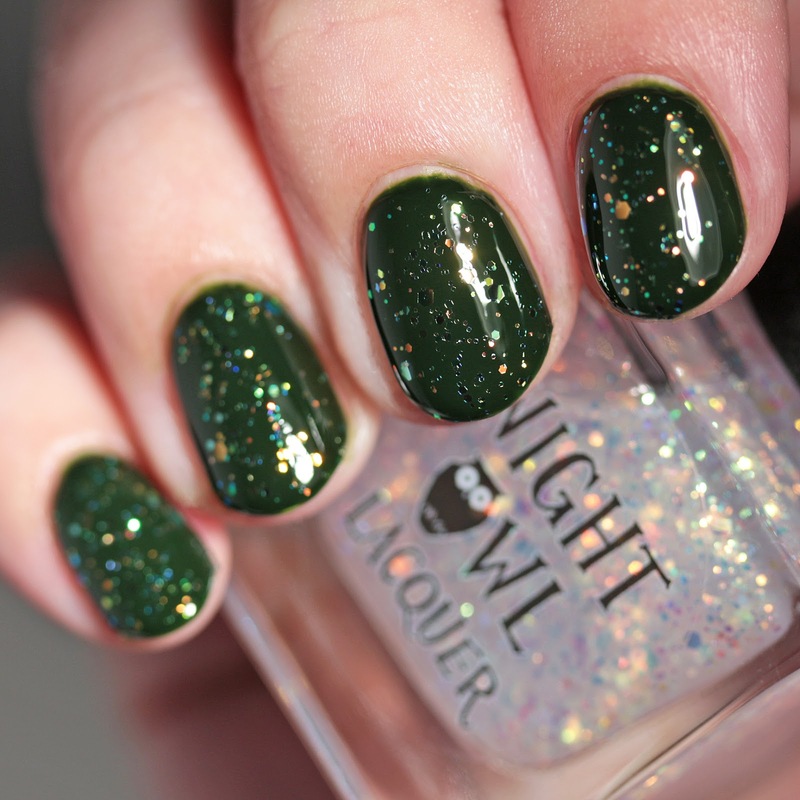 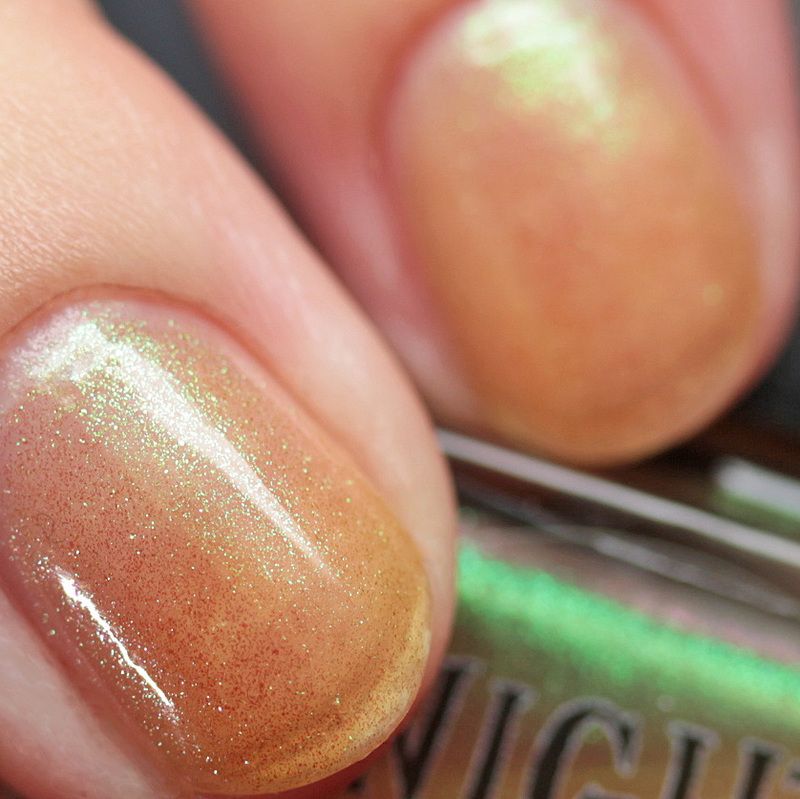 Night Owl Lacquer Lookin' Shifty has gold shimmer with a green-to-magenta shift in a clear base. 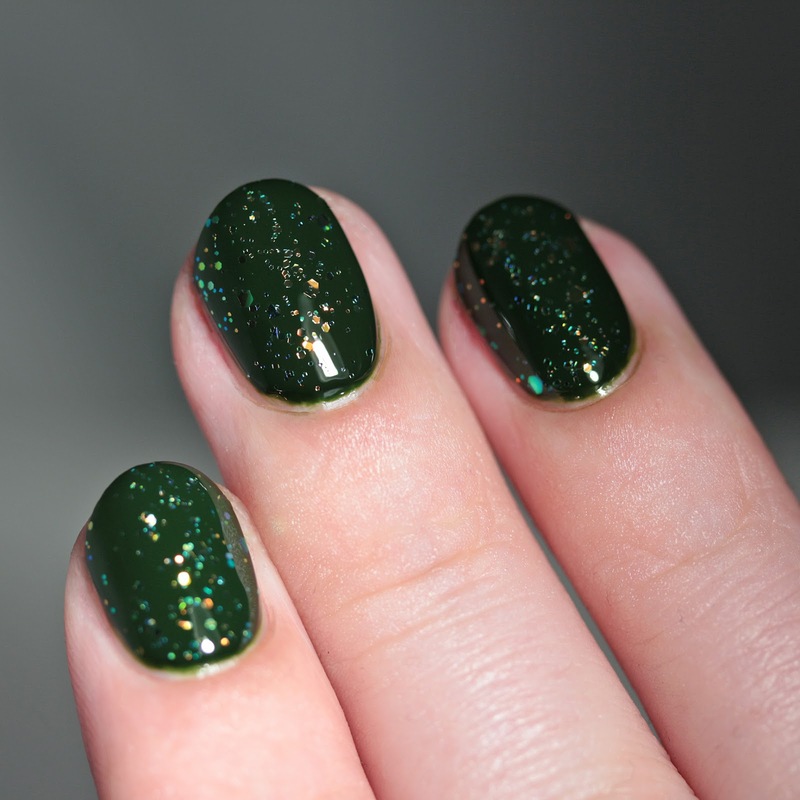 This is worn here on its own in four thin coats. 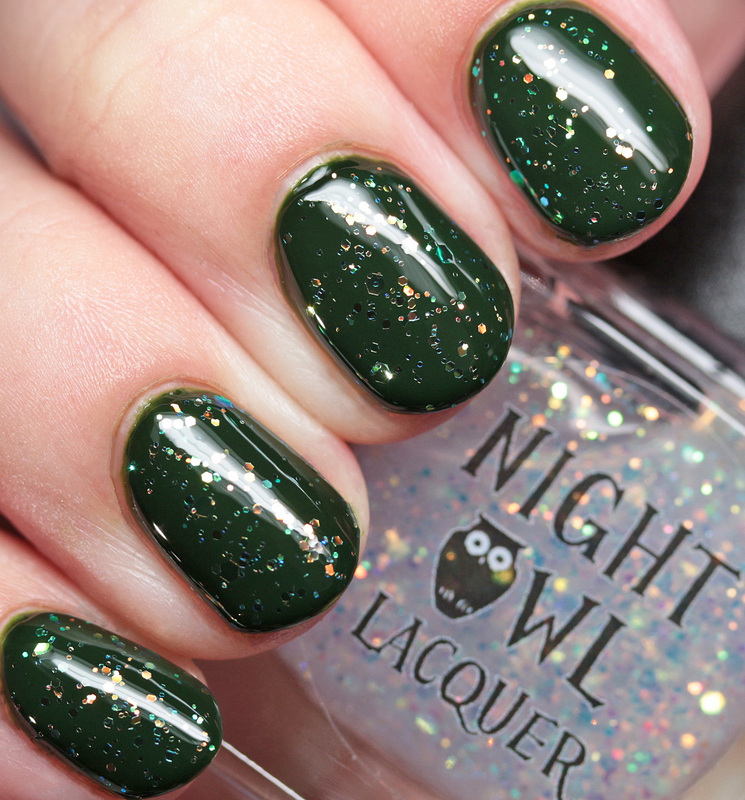 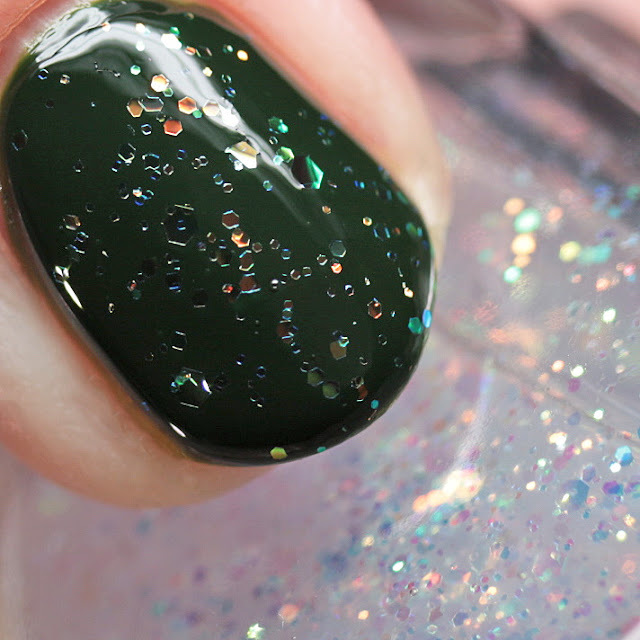 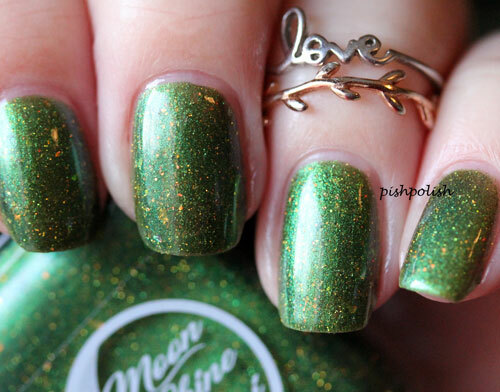 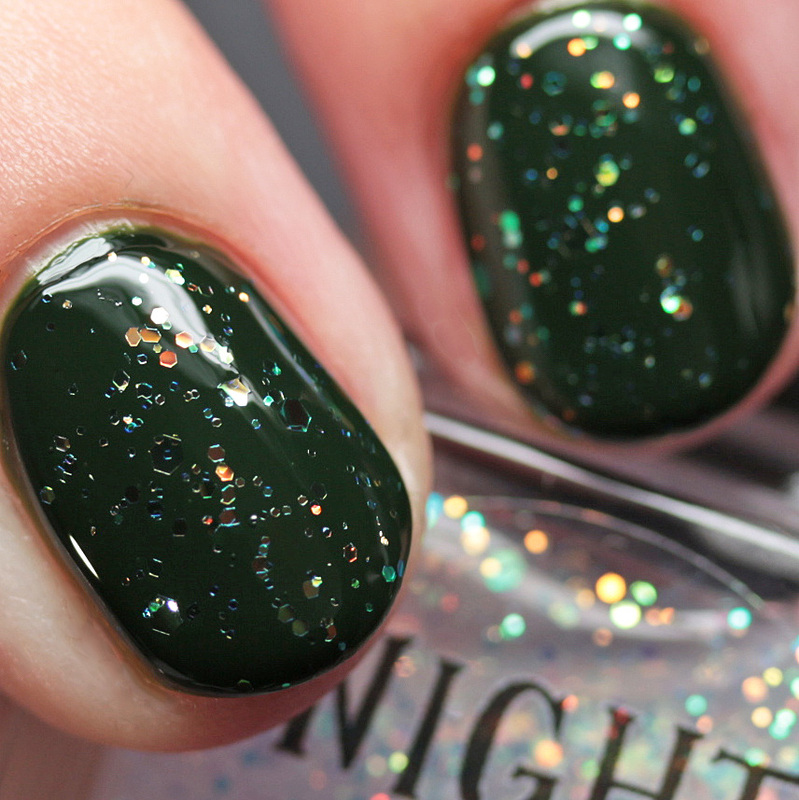 Here is Night Owl Lacquer Lookin' Shifty in one coat over Cackle Much?! 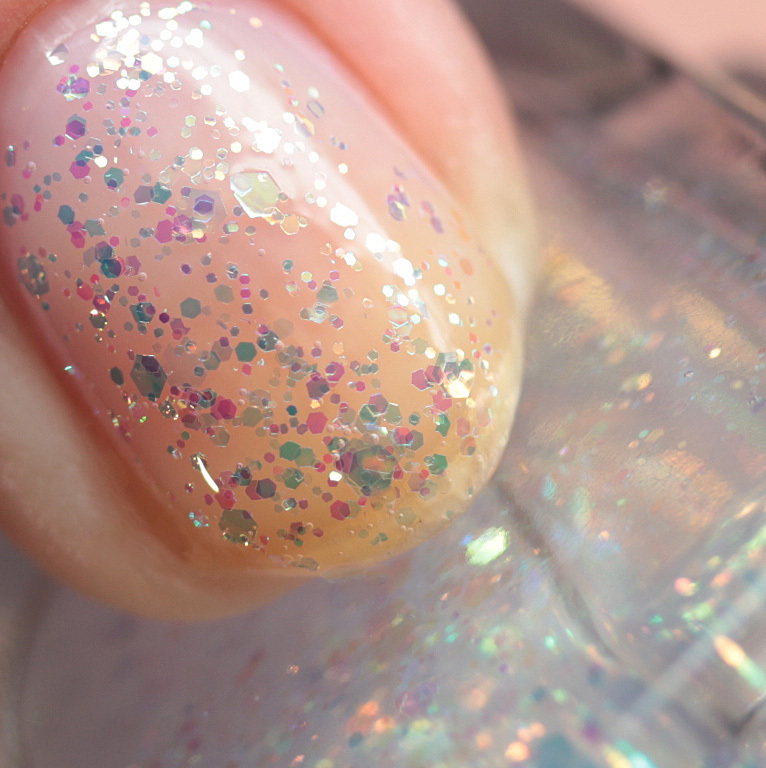 This has plenty of sparkle in one layer. 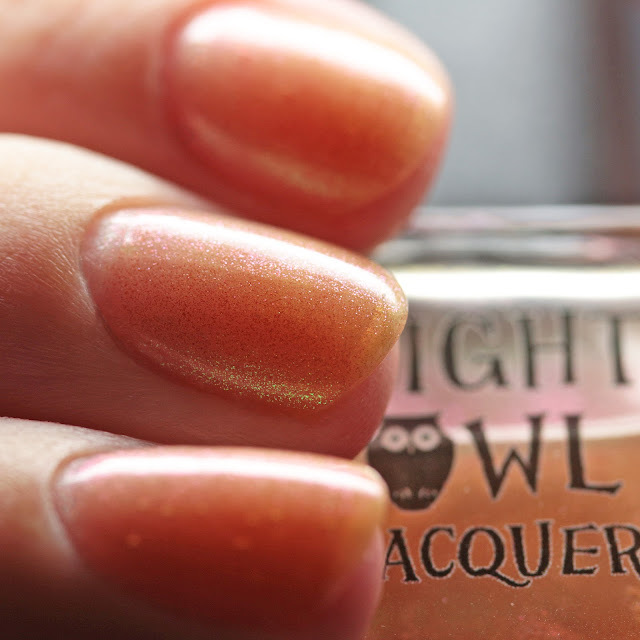 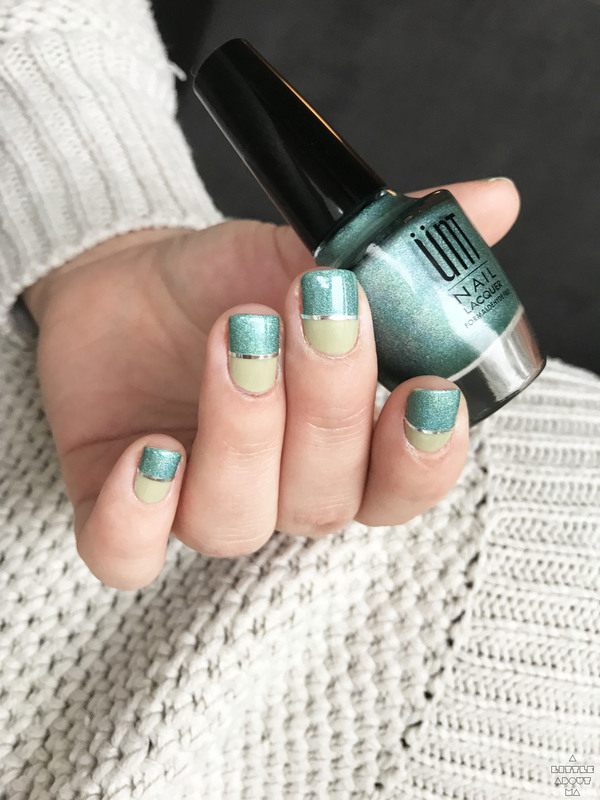 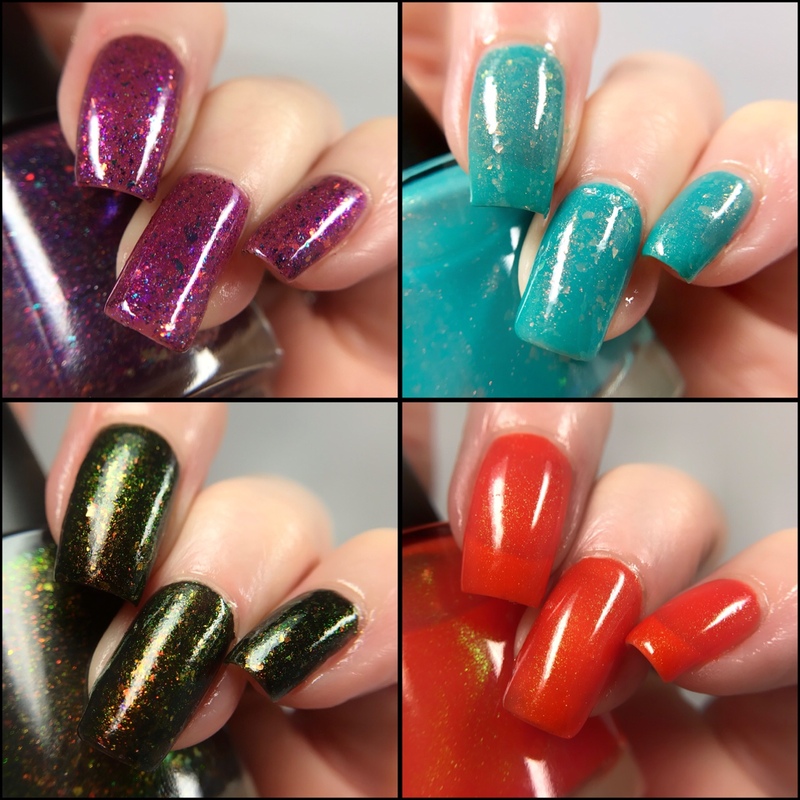 Night Owl Lacquer Potion Bubbles has lime/gold and orange/green iridescent duochrome glitters in a clear base, shown here with four coats on its own. 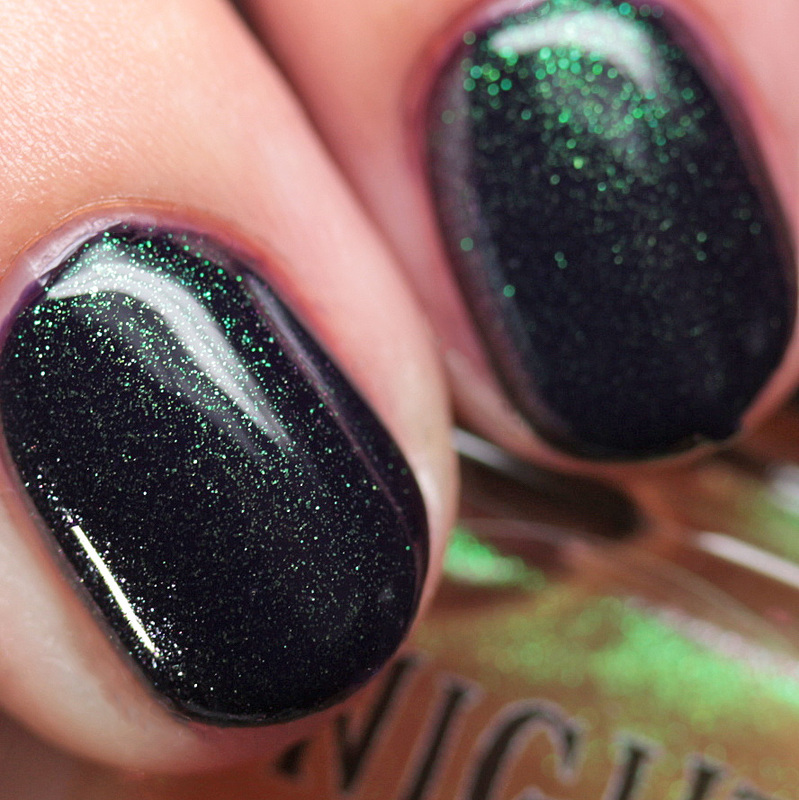 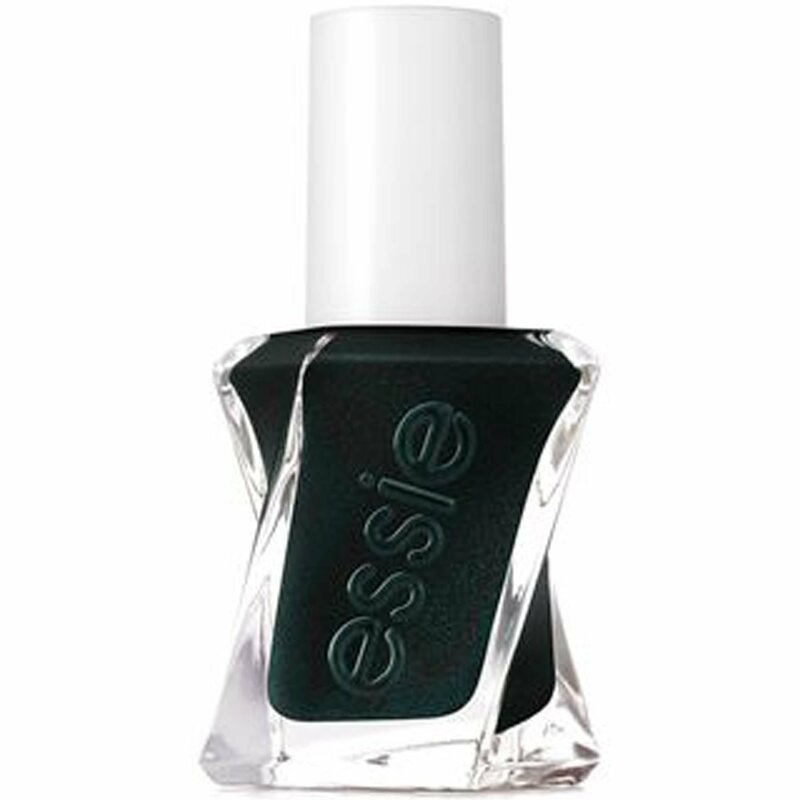 This is Night Owl Lacquer Potion Bubbles in a single coat over Dead Inside. 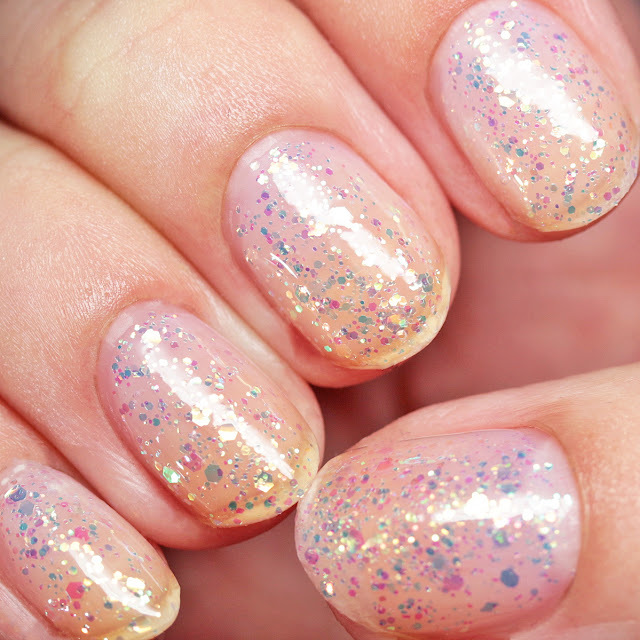 There were no issues getting the glitters to come out or spread evenly. 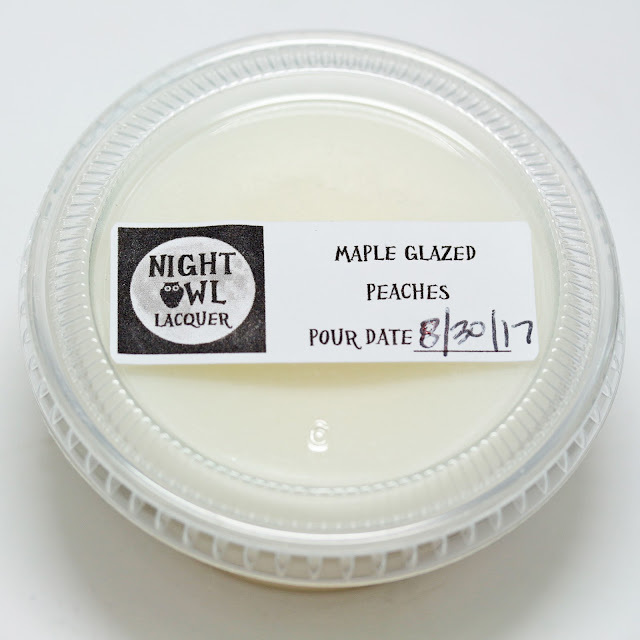 Night Owl Lacquer will also be offering wax melts soon! 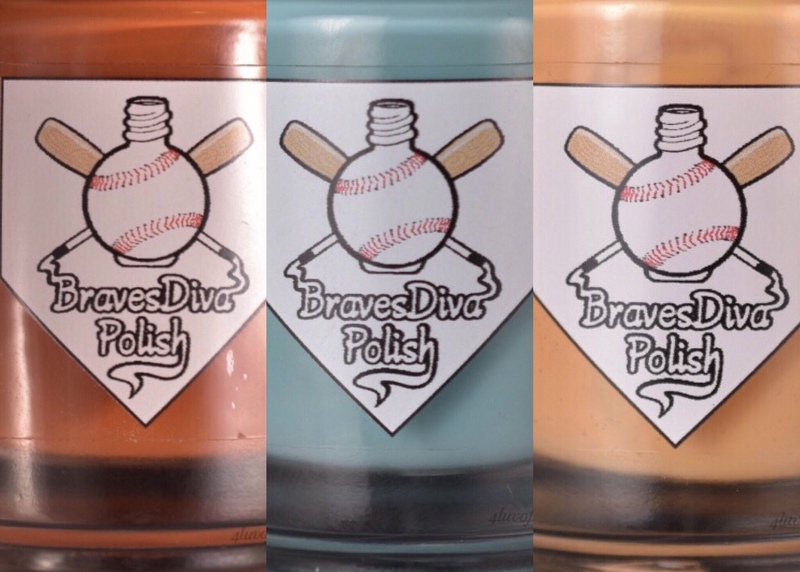 The production versions will be in oval containers and probably colored. Maple Glazed Peaches smells like it sounds - a combo of maple sugar and peach! 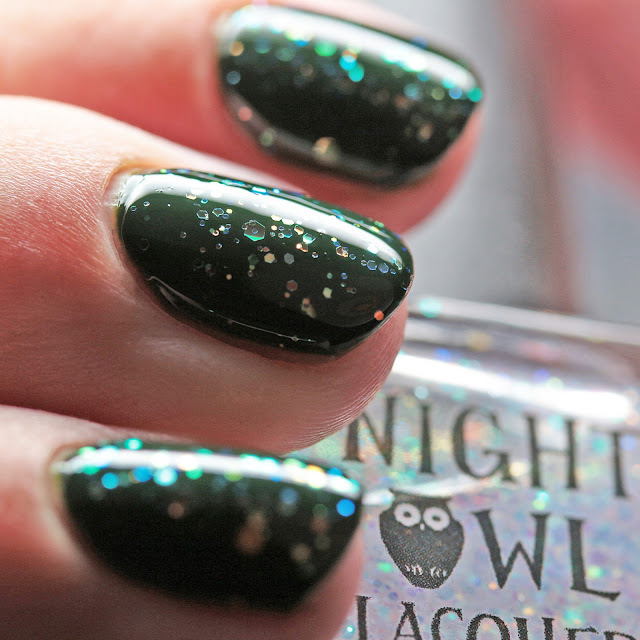 The whole Night Owl Lacquer In the Dark of the Night Collection is available now. 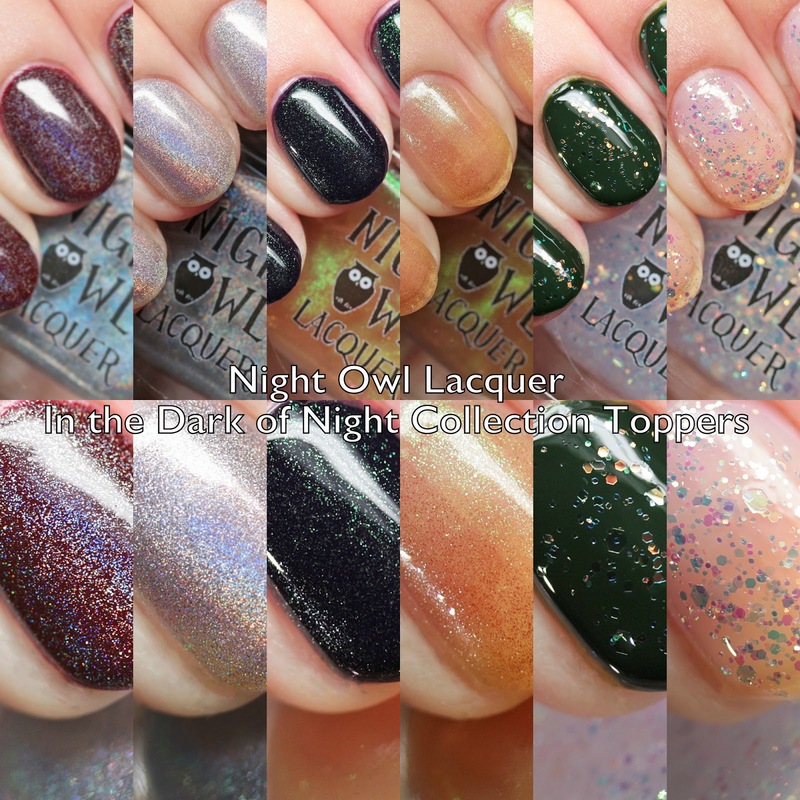 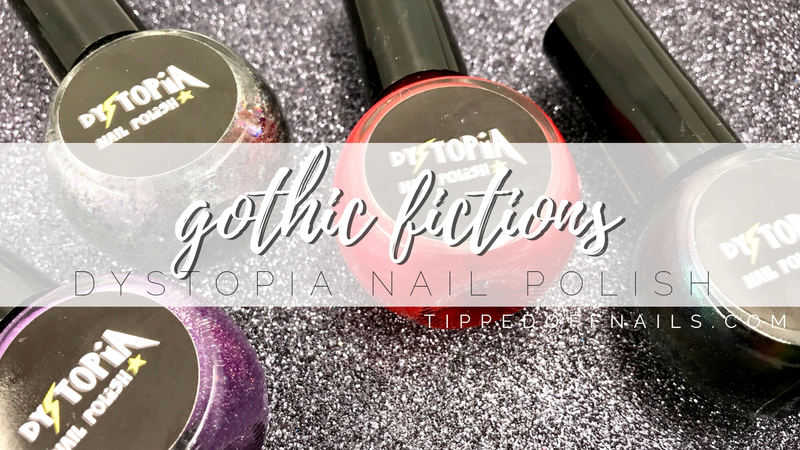 If you missed it, I reviewed the six cremes of the collection here. 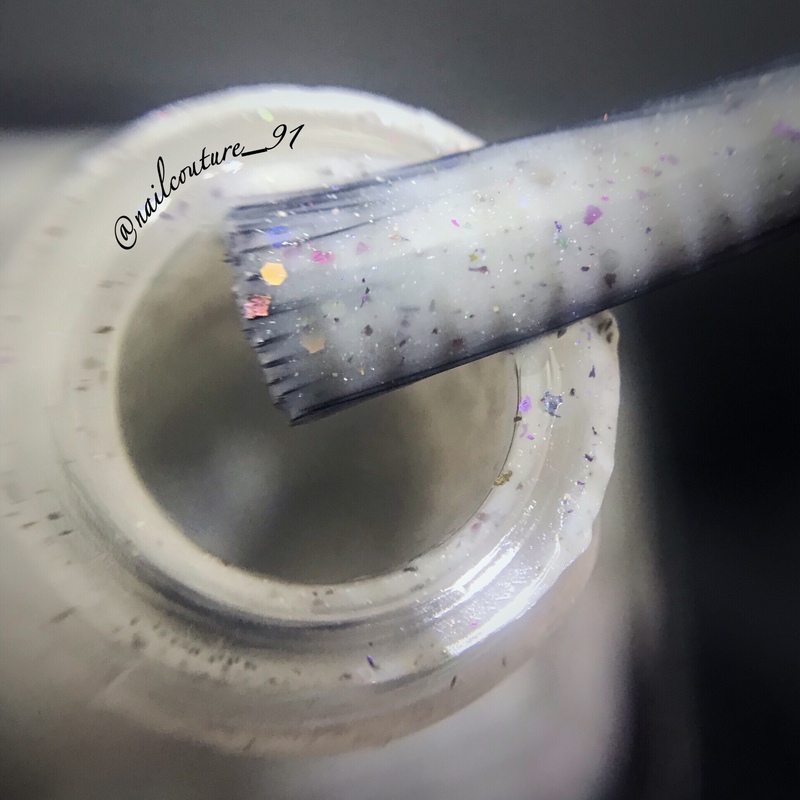 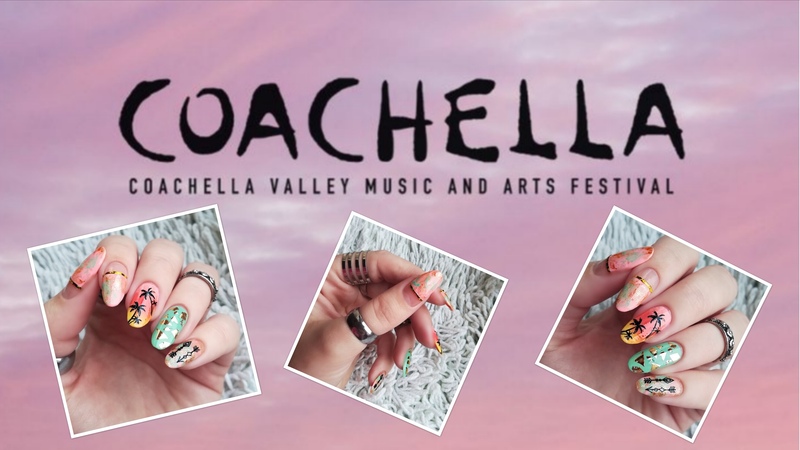 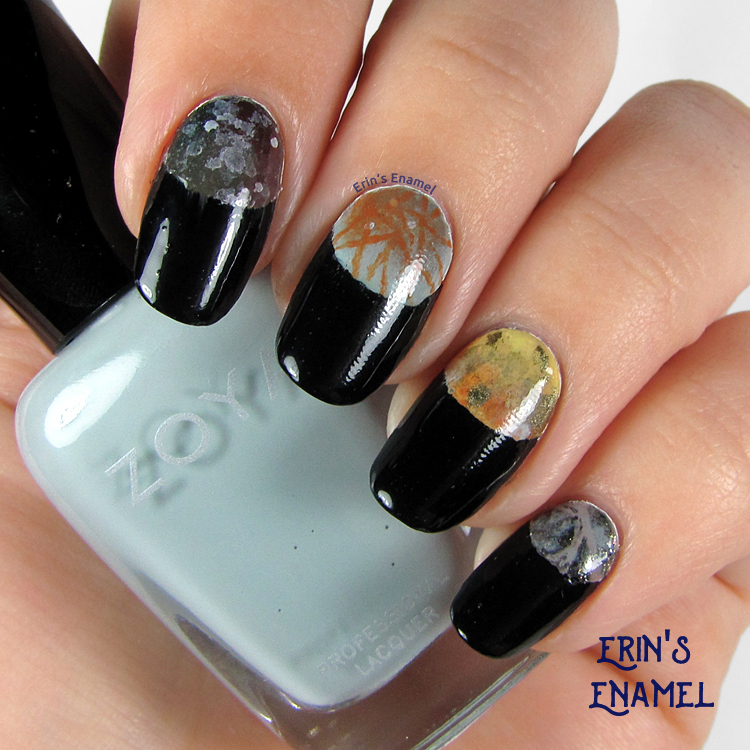 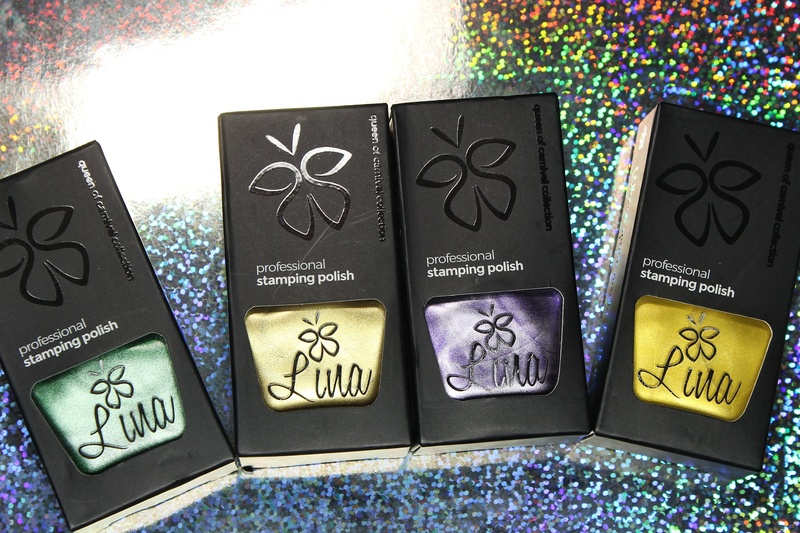 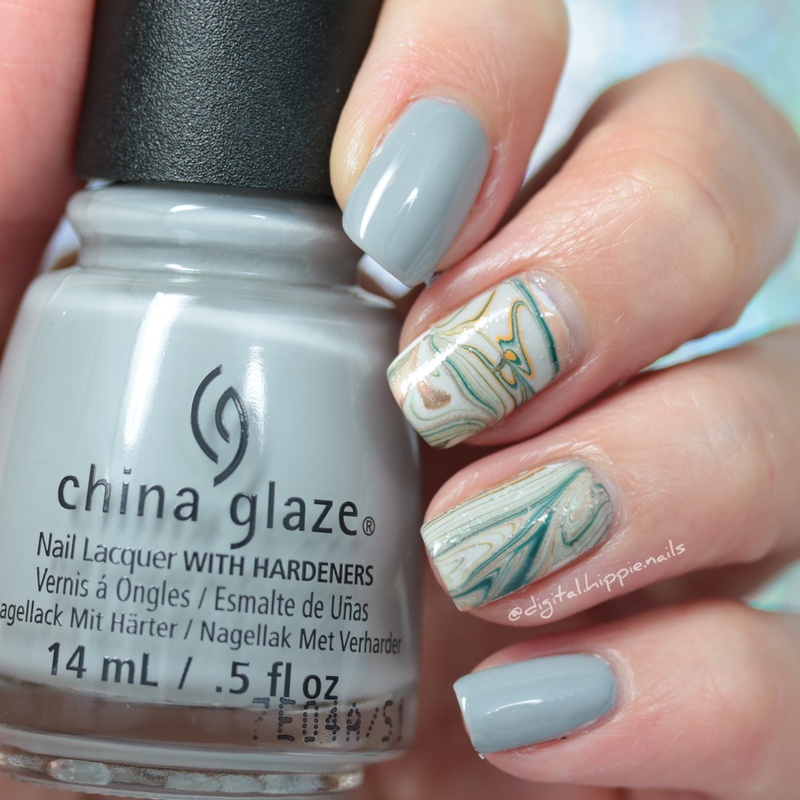 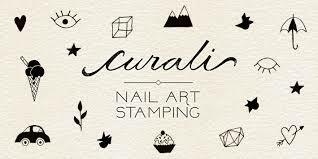 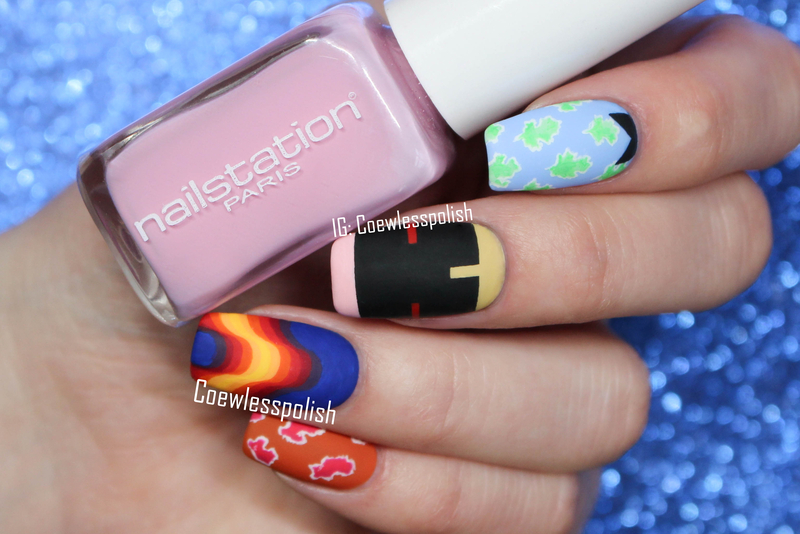 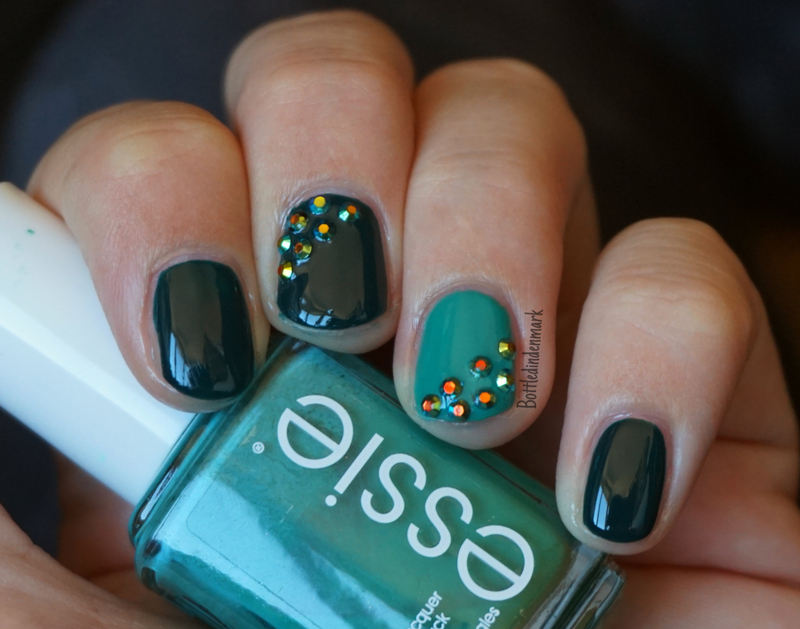 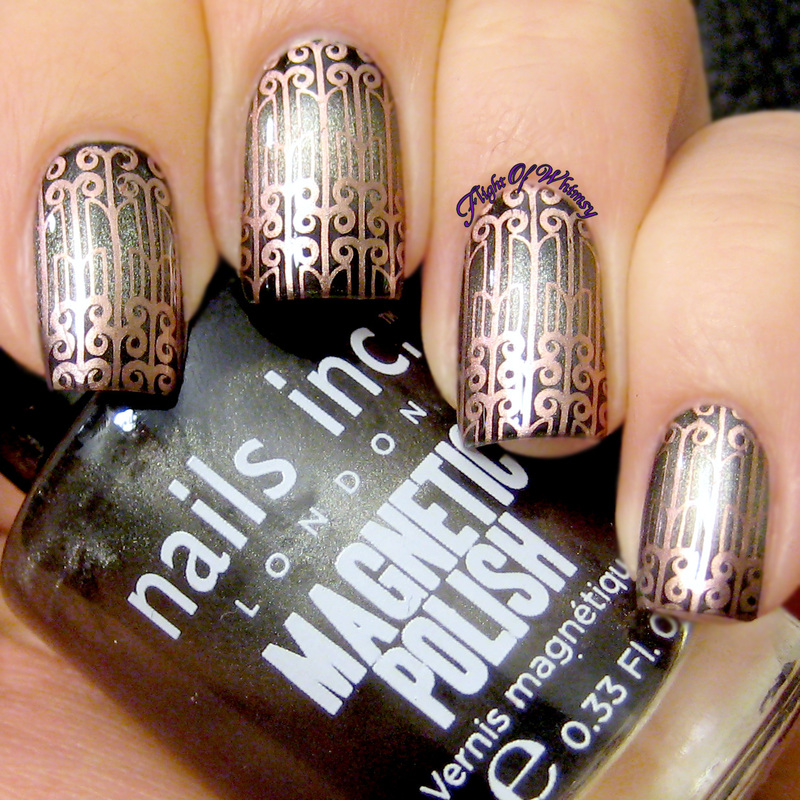 I like the number of options available and the cremes work great for nail art and also with the collection's toppers. 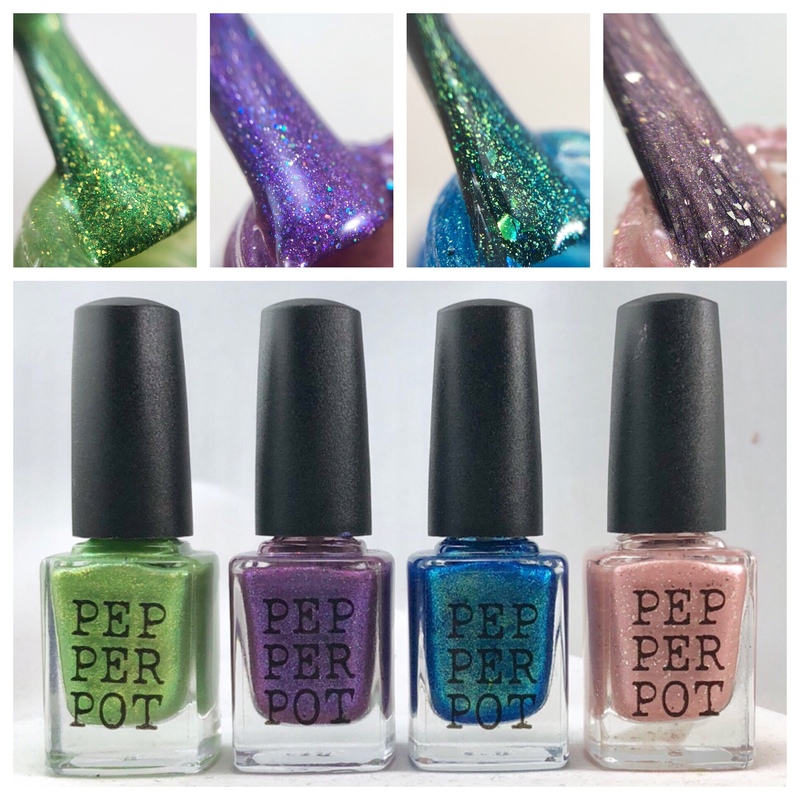 Do you have a preference?